Hosting the Super Bowl — for a third time — has been a long and winding road for Atlanta. In 1965, Mayor Ivan Allen delivered one of his promises from the campaign trail — a sports stadium that would attract a professional baseball team to Atlanta. In 1964, with a promise the Milwaukee Braves would move here, Atlanta-Fulton County Stadium broke ground. While the venue was built for professional baseball, it could also serve as the home of a professional football team, and the upstart American Football League wanted to expand to Atlanta. The league offered a franchise to Rankin M. Smith, Sr., the president of insurance giant Life of Georgia. He turned them down when the more prestigious and established National Football League offered him a franchise. In 1965, Smith paid $8.5 million for an expansion NFL team, which became the Atlanta Falcons. The AFL franchise Smith turned down went instead to Miami. In today’s NFL, a new stadium generally equates to a Super Bowl. That was the case in 1994. The state of Georgia opened the Georgia Dome in 1992, which hosted Super Bowl XXVIII between the Dallas Cowboys and the Buffalo Bills. Sports Illustrated noted the reason Atlanta hosted its second Super Bowl in 2000 was Smith himself. At 71, his health was in decline, and Commissioner Paul Tagliabue awarded the game to Atlanta to honor his loyalty to the NFL over three decades. Smith’s family owned a majority of the team until they sold to Home Depot founder Arthur Blank in 2002 for $545 million. Forbes magazine valued the Falcons at $2.6 billion in 2018. Not a bad return on investment over a 53-year period. 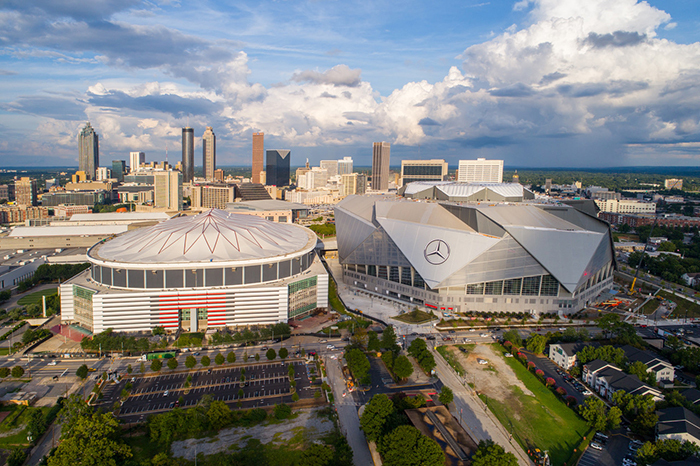 Blank is the man behind the $1.6 billion Mercedes Benz Stadium, which will play host to Super Bowl LIII between the Los Angeles Rams and the New England Patriots Sunday night.